Over 100 delegates attended an Open Seminar focusing on the challenges of maintaining human factors under the most extreme circumstances at QEHB on Friday 6th March. The seminar, “Human Factors in Extremis: Capturing the lessons of the frontline”, was organised by the Clinical Human Factors Group (CHFG), the NIHR SRMRC and the Royal Centre for Defence Medicine. An introduction by Lt Col Suren Arul on human factors and the military was followed by presentations from a number of key military and civilian medical personnel. The varied programme included talks on ‘A toolset for innovation and change’ by Brigadier Tim Hodgetts and ‘Meeting the needs of the deployed surgical team’ by Major Jenny Buck. Sir Bruce Keogh gave the closing speech on ‘Current challenges and opportunities in the NHS’. 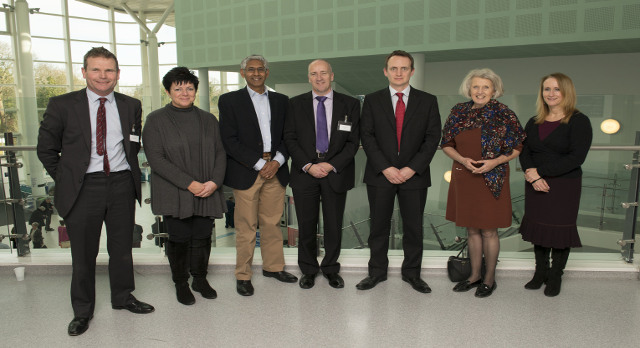 Pictured above, left to right, are: Lt Col Harry Pugh, Major Jenny Buck, Lt Col Suren Arul, Martin Bromiley (Chairman CHFG), Sqn Ldr Mike Kluth, Lynne Caley (CHFG) and Karen Piper (NIHR SRMRC Programme Manager).